i'm often asked what is my favorite thing to cook. well, these lamb chops are pretty close to the top. immediate reactions usually are along the lines of oh wow i could nevvvvver make that. well, folks, i'm here to tell you that yes, you can. lamb chops are actually one of the easier recipes to tackle and gain bragging rights at the same time. see there? i'm just trying to help. with a little (also very easy) prep, you can whip these up on a weeknight before anyone even asks what's for dinner. both the chops and the chimichurri flavors only get better with a day-before prep, so do some the night before, leave it, and all that's left is the grilling when you're ready to serve. bada bing bada boom. 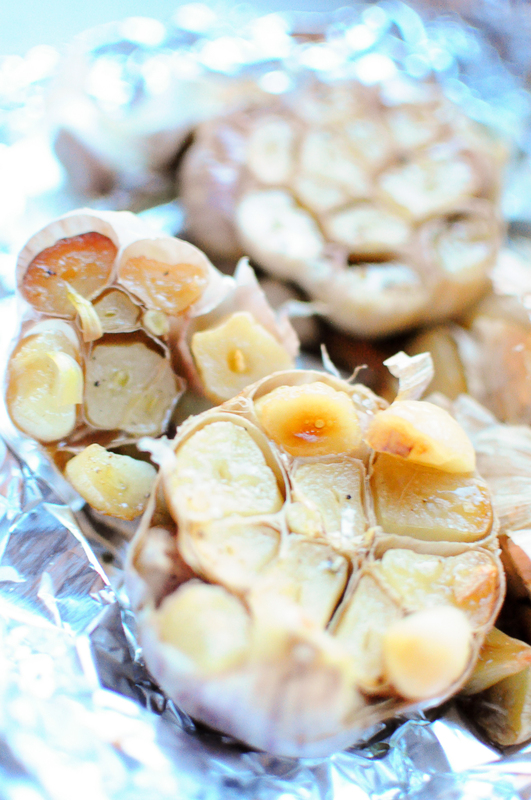 first things first, heat your oven to 350, cut the head of garlic in half, drizzle the olive oil and wrap in foil. Place on a baking sheet and roast in the oven for 20-30 minutes. set aside. 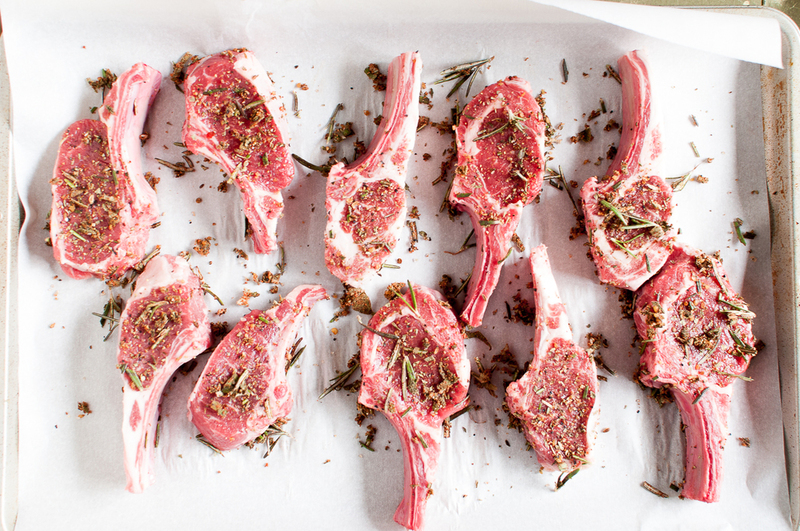 prep your lamb chops on a baking sheet and pat dry with a paper towel. with a mortar and pestle, (or just mash together), add the chopped rosemary, sage, cumin, garlic powder and coriander seed and mix together until it forms a paste-like rub. then, rub generously on both sides of the chops along with the roasted garlic (you'll be able to literally squeeze the garlic out...also, it will make your kitchen smell to die for). you can do this prep either the night before, or a few hours prior to grilling. 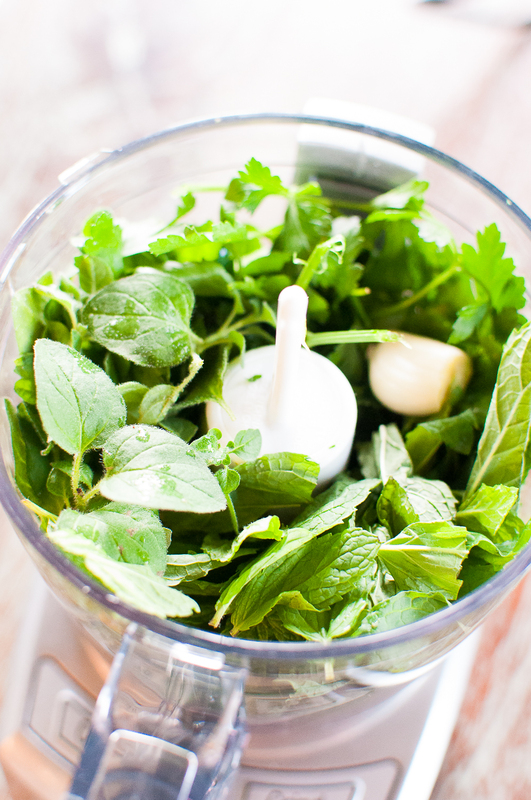 blend mint, parsley, oregano, garlic and shallot in a food processor until finely chopped. the major key here is to then stir in the oil, vinegar and pepper flakes so that it keeps its oil-based consistency and doesn't turn into more of a pesto. when ready to grill, scrape all of the rub off the chops, pat them dry (this will result in the ultimate crispy char), sprinkle with salt and pepper or a montreal seasoning, and set your grill to high heat. grill lamb chops 2-3 minutes per side for medium rare and let rest for a few minutes right off the grill. 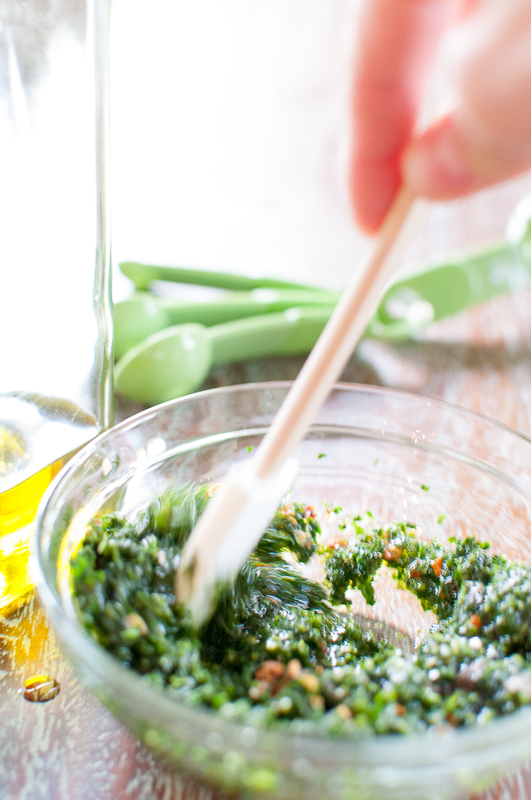 drizzle with the mint chimichurri (with more to on the side to dip, obviously) and enjoy! a spicy zinfandel like the new, incredibly amazing saldo by the prisoner wine co.